I’m not one who usually finds stress to be an issue. I would consider myself to be quite laid back in how I approach life in general – usually when the going gets a bit tough I tend to ‘go to ground’ and stay off the radar for a few days, and then I put the stress behind me and move on to greener pastures. My car has been kicked out of the garage. There’s a line up of chairs waiting to be painted and reupholstered. There are about 20 boxes piled up full of stock, waiting to be loaded onto the ute for delivery to 30 Tamamutu St. There are at least another 20 boxes in warehouses around the country waiting to be dispatched in 12 days time. My dining room table, also my make shift office at the moment, has been getting piled up with my laptop, papers, invoices and sample products from Monday through Friday since we shifted 6 weeks ago. I have been making quite an effort at 5pm on Friday’s to enforce a ‘Tools Down’ rule. In the weekend we have decided to pack up ‘work’ and resort back to ‘normal’ for 2 days and try to switch out of shop mode and enjoy our local surroundings instead. All of the pressure to get things done to a dead line does take its toll. We talked today about how well we handle our stress. Some of us have verbal outbursts. Others shut down completely and internalise it all. Sometimes our bodies just need to sleep it off. For me, stress seems to manifest in pain around my shoulders and neck joints. I’m thankful to have some wonderful Essential Oils to massage on these tender spots and I’m very thankful for the in-house masseuse who knows exactly how to find those niggly knots and massage them away. I’m also very thankful that we have a God of order, who is directing us every step of the way. As I commit each day to Him, He is the one with the timetable for the day, and so I seem to be churning through the work load. I’m not used to sitting at a computer all day. I would far rather be sitting at my sewing machine creating a new bag. At the moment though, sitting at my laptop is something that I just have to do as I load all our products on to an inventory. There will be no cash book or cash register in this modern shop! Our Point Of Sale and Online Shop programme requires every single product that we are selling to be loaded onto a template which can be uploaded onto our site. This takes quite a bit of getting ones’ head around! Sometimes it’s good to have a change of tack and do something different, especially in the weekend. We picked up some dining chairs off Trade Me a couple of weeks ago.The chairs need a bit of a revamp, so they are getting a paint job and the seats will be reupholstered. There is something quite therapeutic about pulling apart an old upholstered seat. Getting under the old staples with a screw driver, and wrenching them out is a good feeling. Sometimes the staples can be pretty stubborn. Some split in half, some staples bend and twist and need pliers to pull them out of the wood. The odd one comes out but leaves a little sharp bit behind. It can be a messy, dusty job. But the finished result once the seat is completely deconstructed is quite satisfying. Especially knowing the new seat will be dressed in something more modern and stylish. I had a eureka moment yesterday. I realised that life can be a little bit like reupholstering a chair. When we choose to surrender our lives completely to Christ, we are giving Him permission to pull out some of those stubborn staples entrenched in our character. Call them mindsets, or old habits that have made us who we are. Sometimes it really hurts to have to face, and deal with some of those stubborn mindsets that have built up over time and become part of our personality. I’m learning that the sooner I stop fighting the process of facing some of the not-so-nice stuff in me, and the quicker I YIELD to His plan to change some of my bad attitudes and ugly thought patterns, the easier it is to move on and put those painful attitudes and patterns behind me. 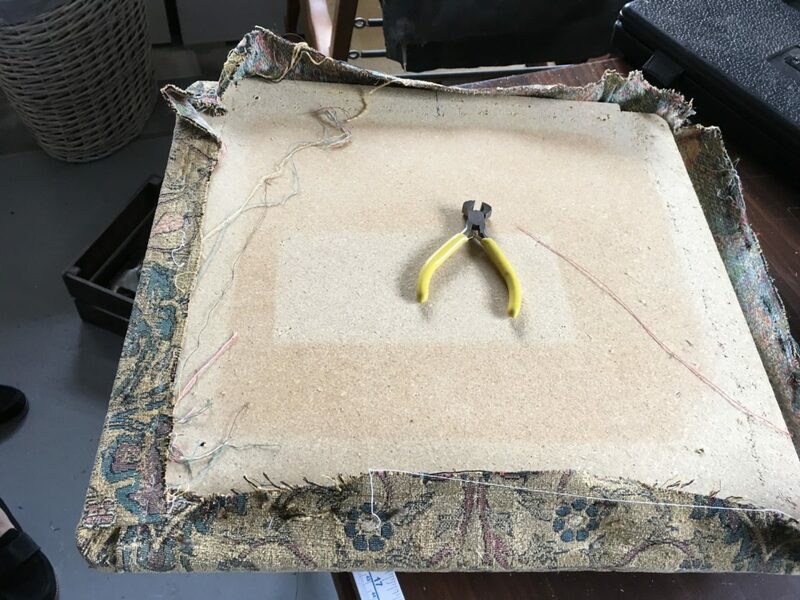 Sometimes relationships can be like upholstery projects too. Toxic relationships can be a bit like borer in wood, and sometimes the root of bad relationships needs to be pulled out and dealt with. Once we get under the root of the disease, healing can begin. As issues are faced and dealt with, repentance and forgiveness can come forth. What emerges in the healing process is something truly beautiful. That is when total restoration becomes evident. I’m going to look at all my newly reupholstered chairs with this in mind. I’m going to look at my chairs being symbolic of lives that have been deconstructed, healed, and reconstructed in a totally new way, displaying new life and beauty in loved and restored treasures. I hope the chairs look comfortable in their new surroundings. There are 7 of them about to undergo transformation, so there’s a bit of pressure on to complete them over the next 2 days. Let the restoration process begin!